July 3, 2011 - Cirrus Aircraft and China Aviation Industry General Aircraft Company (CAIGA) has announced that the two companies have completed their merger. With the previously announced merger now finalized, Cirrus Aircraft, a global leader in general aviation, joins China's leading general aviation product and services company to form a worldwide general aviation enterprise. "We're very excited to have joined forces with CAIGA," said Brent Wouters, Cirrus President and Chief Executive Officer. "This partnership will benefit our business and our customers; we share with CAIGA a vision of worldwide growth. CAIGA has the resources that will allow us to expedite our aircraft development programs and accelerate our global expansion." Wouters also said that he expects the merger to deliver benefits in terms of jobs and job growth in the United States: "Our partners at CAIGA understand the strength and the talent of Cirrus's workforce who have made the Cirrus brand so successful and prominent in the general aviation marketplace. CAIGA will continue to invest in our employees and in our world-class production facilities in Minnesota and North Dakota." "We are very impressed with Cirrus' performance in the global general aviation industry," said Meng Xiangkai, CAIGA president. "It has a very strong record of consistent product excellence, comprehensive safety features, an outstanding management team and a highly skilled workforce who operate from advanced production facilities. We look forward to working with Cirrus' management team to build upon its success and to expand production volume to further cement Cirrus' leadership position in the global general aviation industry." Cirrus Aircraft Co-Founder Dale Klapmeier said the completion of the merger was an important milestone in the company's history: "This is a very positive development that allows us to continue our mission to develop and build the best, most exciting aircraft in the world. Through our merger with CAIGA Cirrus will continue to lead the industry in bringing increased safety, performance, and comfort to the general aviation community." Known for incorporating luxury automotive ergonomics, pilot-friendly avionics and advanced safety features into its high performance airplanes, Cirrus has delivered nearly 5,000 new piston airplanes over the last decade. For nine years in a row, the Cirrus SR22 family of aircraft has been the best-selling four-place airplane in the world. 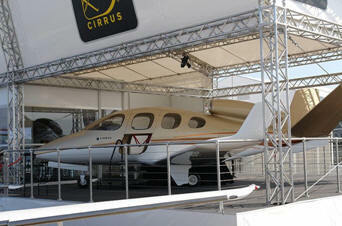 Cirrus pioneered the use of the FAA-certified Cirrus Airframe Parachute System? that is standard equipment on all Cirrus aircraft. Cirrus Aircraft is a recognized leader in general aviation. Its all-composite line of personal aircraft the SR20, SR22 and the turbocharged SR22T, incorporate innovative and advanced performance, electronic and safety technologies, including Cirrus Perspective by Garmin avionics and the unique Cirrus Airframe Parachute System (CAPS). As of mid-2011, total time on the worldwide Cirrus Aircraft SR-series fleet surpassed 5 million flight hours with 48 lives saved to date as a direct result of CAPS being a standard safety feature on all Cirrus aircraft. The Cirrus Aircraft Vision Jet, with nearly 500 production positions reserved, will provide a new personal and regional business transportation solution - the 'personal jet'. All Cirrus aircraft are made in the USA with a direct sales force in North America and authorized sales centers covering export markets in 60 countries around the world.